Had basic at Cochran Field, GA.
Paul Schlundt was his instructor. He had Basic at Cochran Field, GA and graduated from Moody Field, GA, S/N O-791845. He was in the 8th A.F., 459th Bomb Group, 734th Bomb Sqdn. While flying a B-24 over Germany on May 8, 1944, he went down. According to MACR # 4591, he was pilot of a B-24-H (S/N: 42-50278) on an operational mission to Brunswick Germany on May 8 1944. There were 10 crew members on board. Eyewitness accounts reported that 2 B-24’s (Capt. Banks’ and Lt. Hart’s) collided and one exploded, with 2 chutes being seen. However, handwritten on the MACR is “Wrong did not collide.” Banks survived and was in Stalag #3 until released by our troops. His parents received an air medal and four oak leaf clusters while he was in prison. Graduated from Moody Fld, GA. S/N O-791932. Initially assigned to Air Transport Command, Wilmington, Del. According to unverified burial records of Golden Gate National Cemetery, San Bruno, San Mateo County, CA, he was 1ST LT, 1252 Army AF Unit Air Transport Command AC, and is buried in Plot: 2B 2594. Had basic at Cochran Field, GA and graduated from Moody, GA. S/N O-792046. Initially assigned to Air Transport Command, Wilmington, Del. Had basic at Cochran Field, GA. S/N O-792007. He was in the 17th Bomber Grp 34th Bomber Sqdn flying B-26s. He was killed in action on July 20, 1944 near the town of Bosco DI Corniglia, Italy (MACR 6682). He was flying as co-pilot of a B-26 (S/N: 42-96021) when his plane was hit by flak. 5 of the 7 crew members stayed on the plane and were killed when it crashed. Had basic at Cochran Field, GA. S/N: O-792518. He was a B-24 pilot with the 485th Bomber Grp 831st Bomber Sqdn. He was pilot of B-24H (#42-52601) on a mission on September 13, 1944 to Poland from Venosa AAF Italy. 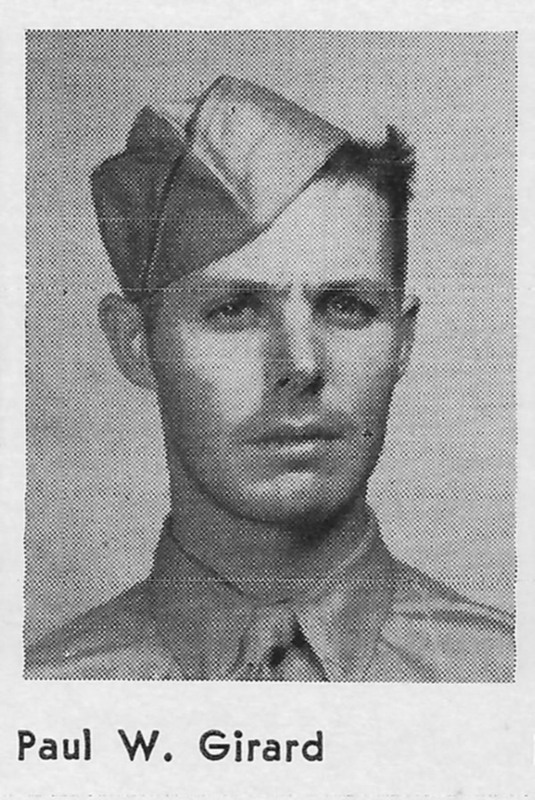 His plane was hit by flak and he died when he bailed out of the plane and hit his head on a cliff when hitting the ground (MACR 08346). The rest of the crew bailed out and survived. He was buried nearby in a partisan cemetery. Had basic at Cochran Field, GA. S/N: O-792959 was a P-47 pilot with the 78th Fighter Grp 84th Fighter Sqdn based at Duxford in England. On June 10, 1944 he was flying a P-47 (S/N: 42-26149) on a mission to Rennes France when his squadron was attacked by Me 109s (MACR #05579). He became a POW in Luft Stalag 7A after being shot down. He had Basic at Macon, GA, Advanced at Moody, GA. Graduated Oct. 7, 1942, S/N: O-792524. He went to the Ferry Command at Newcastle Army Air Base, Wilmington, Del. Later he flew 101 round trips over the “Hump”. After the war he joined the Ohio National Guard. 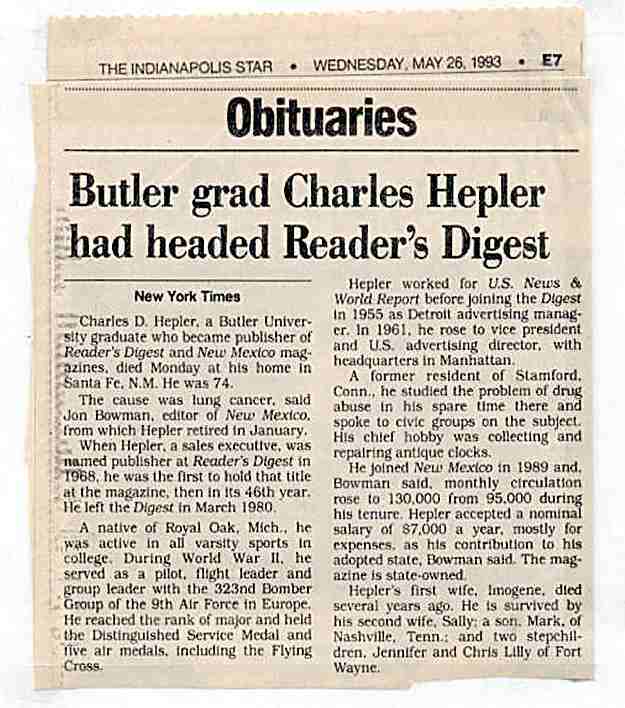 He retired as a Major and Senior Pilot. Born July 11, 1919, Baltimore, MD. Paul Schlundt gave him some of his instruction. He had Basic at Cochran Field and graduated in Multi-Engine. Soon he was instructing in BT-13’s, at least at one known location of Walnut Ridge, Arkansas AAFd. He was with the A.T.C. going the southern route to Africa, on to India and China, and over the “Hump”. He carried supplies over and patients back to the U.S.A.
Had basic at Cochran Field, GA. He was a B-25 pilot with the 69th Bomber Sqdn in both the 38th Bomber Grp and the 42nd Bomber Grp. He was awarded the Silver Star and after WW2 became a Regular Air Force officer and made a career in the USAF. Paul Schlundt was his instructor. He washed out on April 13, 1942. He was transferred to Paul Schlundt on May 8, 1942. He graduated from Primary. He had Basic at Cochran Field, GA but washed out while there. He went on to graduate as a navigator with the Class of 43-06 Selman Field at Monroe, LA on May 1, 1943 (S/N: O-800997). He reported to the 306th Bomb Group 368th Bomb Squadron as a navigator on February 16, 1945 and departed the ETO in October of ’45. He was assigned to the Gordon Dobbs crew. Click here for his picture with the crew (a PDF). Had basic at Cochran Field, GA. S/N: O-792970. He served with the 50th Fighter Grp 10th Fighter Sqdn (P-40E) and Died Not in Battle afterwards. Had basic at Cochran Field, but washed out while there. Had basic at Cochran Field, GA. S/N: O-793406. 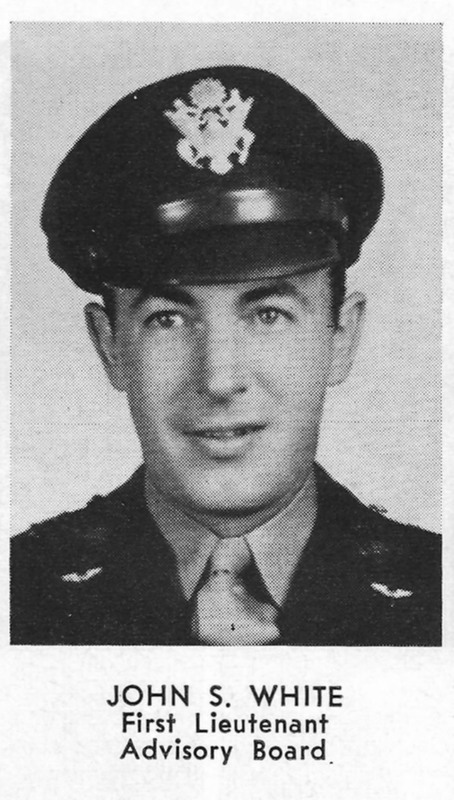 He was a B-17 pilot and served with the 96th Bomber Grp 413th Bomber Sqdn and became a POW in Luft Stalag 1 after being shot down on October 20, 1943 (MACR #01018). Had basic at Cochran Field, GA. He graduated from the Officer Candidate School at Miami Beach, Florida with the Class of 42F, which graduated on December 9, 1942. He washed out while at Douglas. He graduated as a bombardier in the Class of 43-01 at Roswell AAFd in New Mexico on January 7, 1943, S/N: O-735310. He served with the 390th Bomber Grp 569th Bomber Sqdn and managed to evade capture by the Germans after being shot down on August 15, 1943 (MACR #00258). Paul Schlundt was his instructor. He had Basic at Cochran, GA and graduated Twin Engine. He then instructed in B-26’s. He was a B-26 pilot serving with the 323rd Bomber Grp 453rd Bomber Sqdn and flew 35 missions with the 9th A F in Europe. Died May 24, 1993, age 74. He graduated (S/N: O-792539) and was sent to Wilmington, DE. From that base he was in the Ferry Command and was delivering planes of all types to most of the States, Iceland, England, and Africa. He then flew C-54s at Homestead, FL. From there he went to the Pacific where he was flying from New Guinea to Japan, ferrying passengers and cargo in and wounded out. At the end of the War, he flew the “Hump” for 20 some missions and was then sent home. Paul Schlundt was his instructor. Basic at Macon, GA and Advanced at Moody Fld, GA. S/N: O-792540. Initially assigned to Air Transport Command, Wilmington, Del. ferrying planes throughout the country and the world. His later assignment was on a base in India, where he ferried cargo over the Himalayan Mountains into China. Born May 14, 1917, in Trenton, N.J.
Married Florence Parker in 1942. Obituary: DeLand-Deltona Beacon, The (FL) – Thursday, January 29, 2009. S/N: O-792992 He was a C-47 pilot serving with the 374th Troop Carrier Group in the Southwest Pacific Area. S/N: O-792541. Initially assigned to Air Transport Command, Newcastle Army Air Base, Wilmington, Del. Killed in a plane accident while there. Paul Schlundt was his Instructor. He went to Cochran for Basic and Moody for Advanced. He was a 2nd Lt. and assigned as Basic Instructor at Cochran. He was transferred to the Central Instructors School at Randolph Field. He stayed there for the duration. In Dec. 1946 he was studying medicine and joined the Air Reserves. Died March 20, 2003 age 85. Had basic at Cochran Field, GA. S/N: O-792995. He was a B-29 Superfortress pilot serving with the 497th Bomber Grp 870th Bomber Sqdn and was Killed In a Flying Accident and Missing on June 6, 1945 after ditching his plane near Kwajalein Island in the Central Pacific. S/N: O-792544. Initially assigned to Air Transport Command, Wilmington, Del. 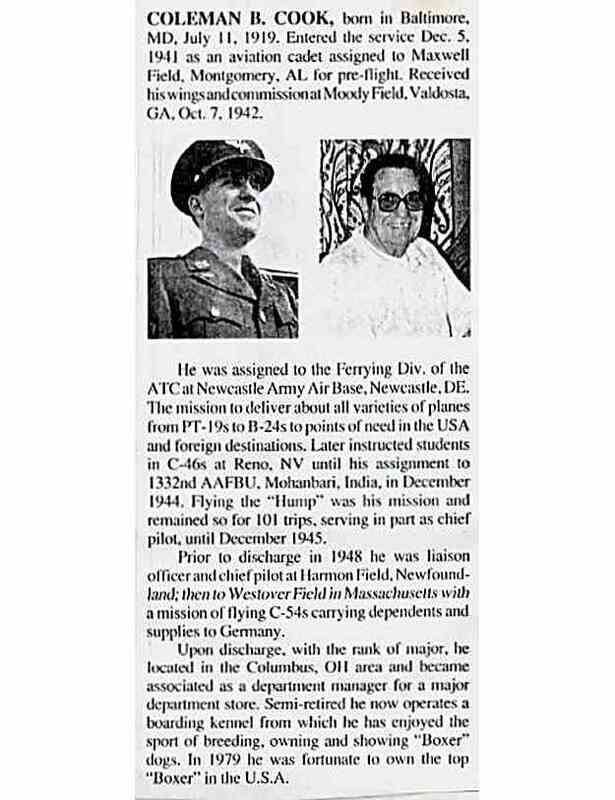 Had basic at Cochran Field, GA. S/N: O-792545 He served at some point at the Avon Park AAFd as a pilot and retired disabled from the Air Force on February 16, 1945. He started in class 44G. Paul Schlundt was his instructor. S/N: O-792342. 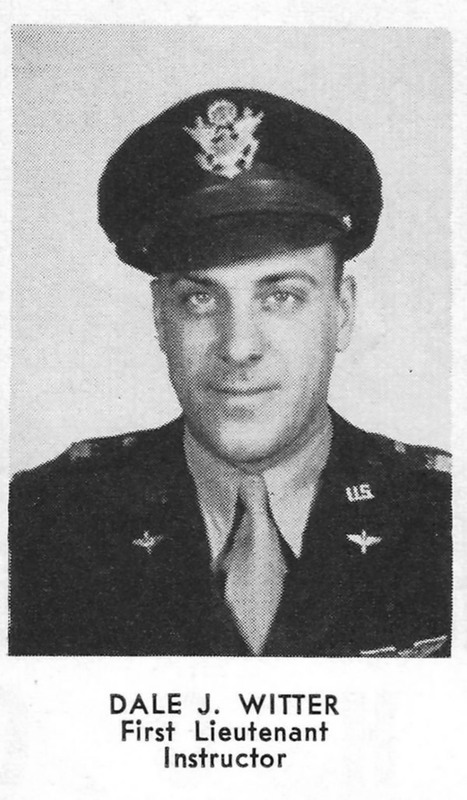 He was a B-24 pilot training with the 453rd Bomber Grp 732nd Bomber Sqdn in the United States and was Killed In a Flying Accident in Wyoming on August 14, 1943. S/N: O-792548. Initially assigned to Air Transport Command, Newcastle Army Air Base, Wilmington, Del. Married while there, and settled in Wilmington. Had basic at Cochran Field, GA. S/N: O-792549. He was a B-26 pilot serving with the 344th Bomber Grp 495th Bomber Sqdn and became a POW after being shot down on October 6, 1944. He died back in the States from an accidental gunshot wound on April 5, 1946. (see Find A Grave). He received the Purple Heart with one cluster, Distinguished Flying Cross, Distinguished Service Cross and the Air Combat Medal with one cluster. Had basic at Cochran Field, GA. He was a B-25 pilot with the 340th Bomb Group 486th Bomb Squadron flying his missions from Corsica. From Wednesday, November 11, 1942 newspaper: Springfield Republican (Springfield, MA) Page: 3: Francis H. Root commissioned a 2nd Lt at Moody Field. He received all of his flight training at army fields in Georgia. Westfield, Jan. 26 – Lieut Francis H. Root, 26, army air corps pilot, son of Mrs. Hattie (sic – possibly Haddie) Root of 12 Ellsworth Ave, who recently was returned to this country after completing 50 combat missions over Italy and North Africa, is at his mother’s home on a 20-day leave. …No details of his combat service are revealed. Lieut. Root will report to duty at Atlantic City, NJ upon completion of his leave. From Massachusetts originally. Of East Point, GA in 1978 when his mother died. Had basic at Cochran Field, GA. He appears to have graduated with the Class of 42K. S/N: O-794363. He was a P-40 pilot serving with the 18th Fighter Grp 70th Fighter Sqdn in the Southwest Pacific Area and was KIA on November 8, 1943 over New Guinea. (MACR #01090). Distinguished Flying Cross, Air Medal with 3 Oak Leaf Clusters, Purple Heart. Paul Schlundt was his instructor. He soloed Apr. 16th, 1942. He had Basic at Cochran, Ga Field and graduated from Moody Field, GA.
Had basic at Cochran Field, GA. S/N: O-793027. He was a P-51 pilot serving with the 361st Fighter Grp 375th Fighter Sqdn in the Eighth Air Force and became a POW after being shot down on December 12, 1944 (MACR #11173). He started in class 42H. Had basic at Cochran Field, GA. He was a B-26 pilot serving with the 394th Bomber Grp 585th Bomber Sqdn with the Ninth Air Force in Europe and was WIA on April 22, 1944. Had basic at Cochran Field, GA. S/N: O-792556 He was a reconnaissance pilot serving with the 7th Photo Recon Group 13th PRS with the Eighth Air Force and was Killed In a Flying Accident on February 5, 1944 in England. Had basic at Cochran Field, GA. S/N: O-793032. He was an instructor pilot at Newport Army Air Field in Arkansas. Had basic at Cochran Field, GA. He was an instructor pilot at Newport Army Air Field in Arkansas.